The first results from the Hutchinsons Fenland potato demonstration have provided insight into the unique agronomic characteristics and resilience of Fenland soil. 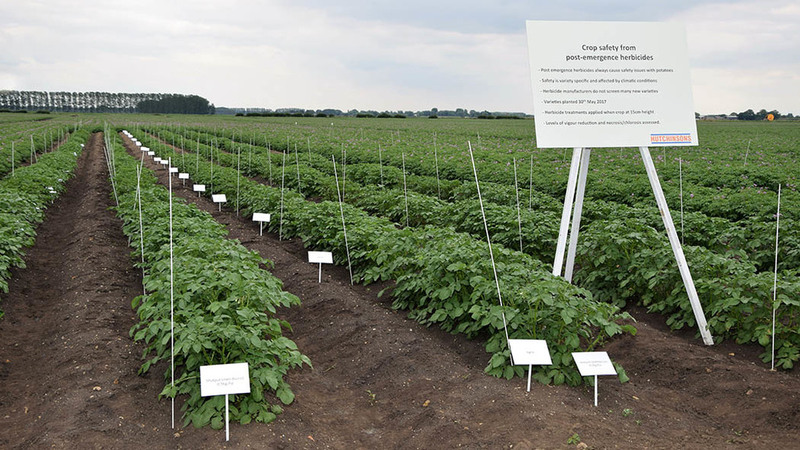 A range of trials were conducted at Friesland Farm near Mildenhall, Suffolk, with some of the clearest visual differences in the post-emergence herbicide trial, which examined the crop safety of leading chemistry on 22 new and established varieties. Noticeable differences in chlorosis (yellowing) and necrosis (dead leaves) were recorded across the varieties and post-emergence products, although Hutchinsons root crop technical manager Darryl Shailes says it is too early to make recommendations beyond the limited manufacturer information. “We can’t draw conclusions based on one year’s work, especially as this is such a forgiving soil. Several varieties showed signs of damage soon after herbicide application, but many recovered quickly. Other soils and seasons could be very different,” he says. One trial in Maris Peer found that despite high background PCN pressure (60 eggs/g), there was no discernible difference in canopy growth between untreated and nematicide-treated plots. However, yield increases from using a nematicide were found at lifting. 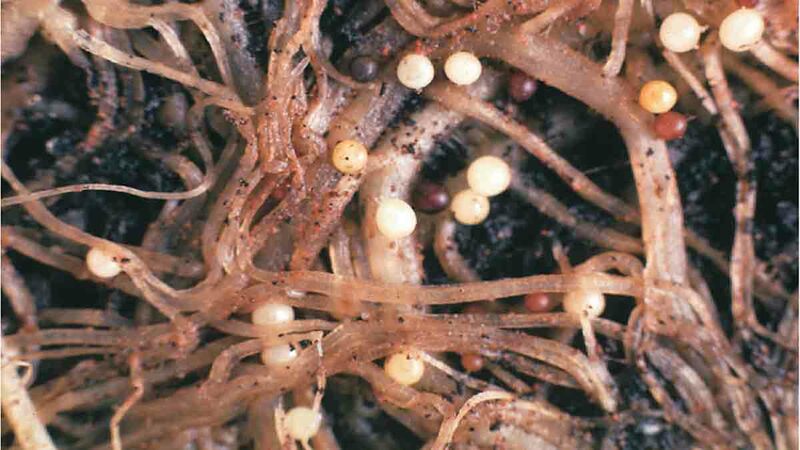 Nematicide use also reduced the build-up of PCN, although PCN population increase in the untreated was less than is typical for organic soils. PCN multiplication was further examined in a separate trial looking at “tolerance” and “resistance” of 15 packing and processing varieties. Around half of those tested, including some popular types, were shown to allow PCN to multiply in the soil, while others reduced egg counts over the season, by up to half. Dr Keer says the differences are due to resistant varieties preventing PCN completing its life cycle, which reduces egg counts, whereas tolerance is the plant’s ability to withstand damage from juveniles feeding on roots and produce a reasonable yield. Resistance says nothing about the crop’s resilience to root damage, while tolerant varieties may yield better but still allow PCN to multiply. The forgiving nature of the soil again limited the yield responses recorded, but there was still a clear benefit from applying a nematicide to resistant and tolerant varieties to reduce PCN multiplication. The Maris Piper seed age trial run by local agronomist Stefan Williams also showed interesting results. Although large variations in tuber size across seed lots made it impossible to identify a correlation between seed age and yield or stem numbers, it demonstrated the impact tuber size has on chits, stem numbers and yield. Fifty tuber weights ranged from 6kg (Welsh seed) to 2kg (Yorkshire sample), which had a clear impact on chit numbers, with the largest seed having 5-6 chits and the smallest just 1-2. Providing chits do not get knocked off during planting, Mr Williams says there is a direct benefit to above ground stem numbers and final yield (tubers produced) from having more chits.